“M/s. Anna cloth store, House no. 07, Road no. 14 North 302, TUCSON AZ 85705, USA has purchased 2000 meters of suit cloths with a total cost of 12000$. Form Michel enterprise. : M/s. 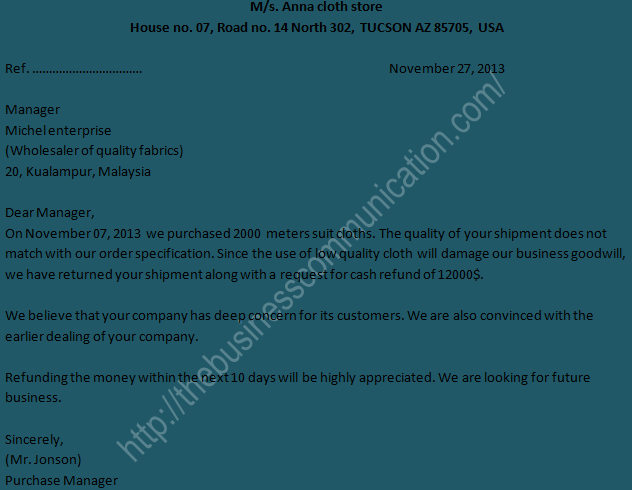 Anna cloth store has returned the shipment as quality does not match the order specification.” – Write a claim letter to the manager, Michel enterprise, 20, Kualampur, Malaysia. Claiming full refund of the purchase price. On November 07, 2013 we purchased 2000 meters suit cloths. The quality of your shipment does not match with our order specification. Since the use of low quality cloth will damage our business goodwill, we have returned your shipment along with a request for cash refund of 12000$. We believe that your company has deep concern for its customers. We are also convinced with the earlier dealing of your company. Refunding the money within the next 10 days will be highly appreciated. We are looking for future business. “The Bangladesh Commerce College, Road No 7, Uttara, Dhaka has purchased some books from Jamuna Publishing Pvt. Ltd. Bangla Bazar, Dhaka. The publisher has sent older edition of the books.” – Write a claim letter for replacing the books with the new edition. In response to our November 10, 2013 order letter, you have sent the ordered books. You delivery has reached to us on November 20, 2013. We have got all the books. But you have sent the older edition of some books. Books of older edition are being returned. We are requesting for replacing the books with 2013 edition.